Krok was originally a G1 action master, a non-transforming action figure paired with a small transforming partner, in this case an alligator named Gatoraider who could convert from an alligator to a hand held blaster for Krok to wield. 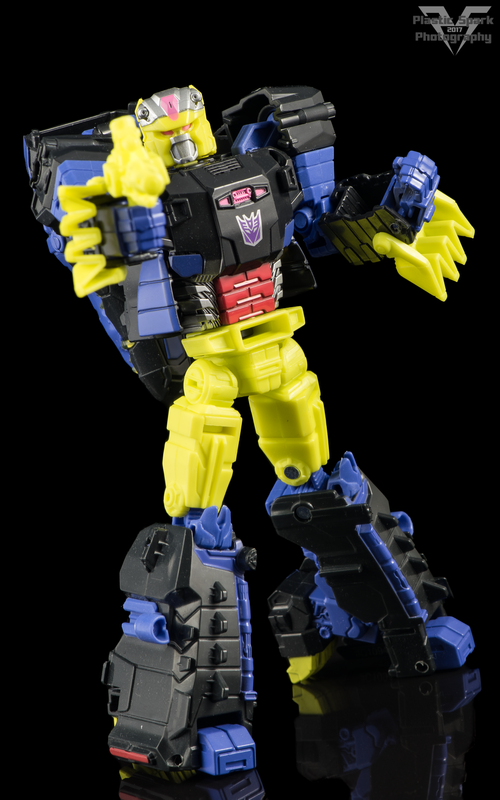 More recently Krok has gained notoriety as a member of the fan favorite group, the Scavengers, in IDWs “More Than Meets the Eye” comic series. This figure is a repaint of the previously released Titans Return Skullcruncher/Skullsmasher and rather than including his target master partner Gatoraider, he now turns into a mechanical alligator/crocodile. Is he an alligator? Is he a crocodile? I don't know, I'm not Steve Irwin! Regardless, this mechanical reptilian beast is as cool as it was in the original release. Head and tail articulation, moderate leg movement, and an opening mouth make for a lot of expression on this mold. Translucent plastic is used for the eyes and teeth, this guy would look pretty cool if you could light up his head somehow! The gloss black paired with bright neon green/yellow and painted purple details make for an incredibly striking appearance and he really stands out in a display. There are Titan Master pegs on his forearms, as well as a functioning cockpit made of flexible translucent material. Krok’s Titan Master, Gatorface (likely a tribue to Gatoraider with a different name) is composed of a purple chest and thighs with bright green legs, arms, and head. It can be incredibly hard to parse detail in his face due to the incredibly bright color of the plastic and lack of paint application. I am unsure if this Titan Master is an homage to any particular Transformers character. Let me know in the comments if you have any info! Krok is clearly attempting to homage his original Action Master toy more so than the modern comic book design. The color layout and pallet are practically a dead ringer for the original toy. I absolutely love the blazing neon colors combined with dark blacks and purples. 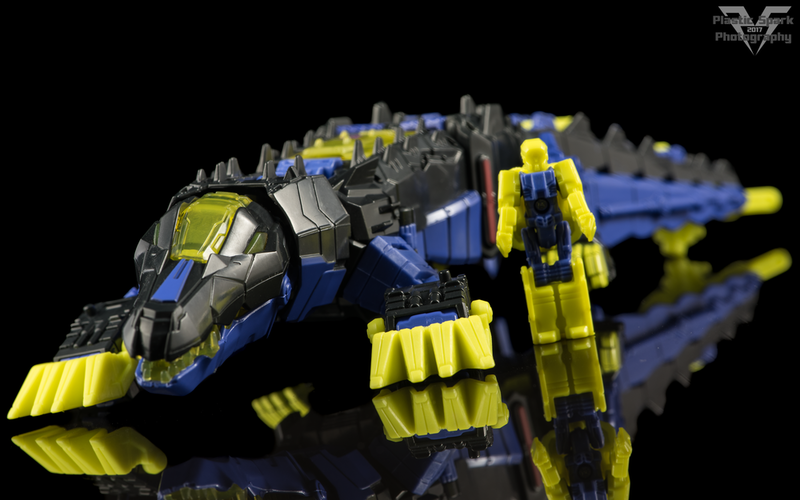 He now has a few additional pieces of alt mode kibble revealing his reptilian alt mode if you look for them but otherwise this is a pretty faithful recreation of Action Master Krok. 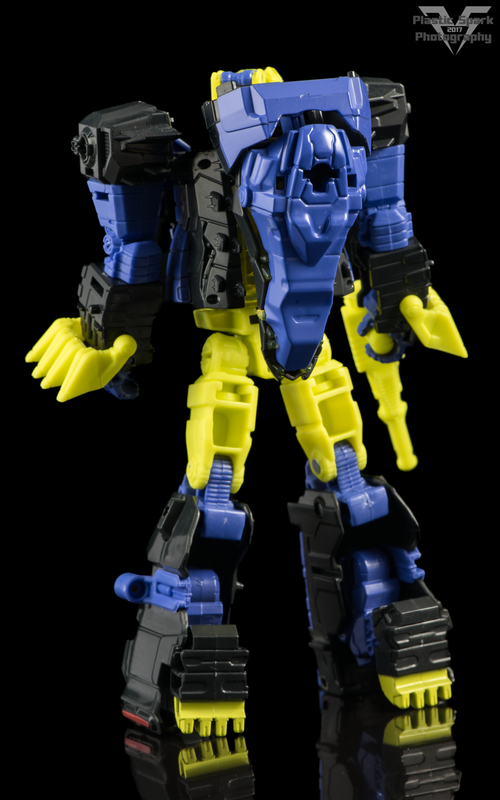 It would have been nice to see a little more of the IDW influence on this figure given his new found popularity but ultimately I think Krok is an incredibly striking figure that really makes this mold his own despite the fact he has zero retooling aside from a different Titan Master. I do have to mention that the mold seems to have been vastly improved between Skullcruncher and Krok. The loose waist/hip/thigh swivels that existed on Skullcruncher are not present on my copy of Krok, and the disintegrating wrist pegs are not an issue either. This version of the mold feels incredible in comparison and kind of makes me wish they would do a second run of Skullcruncher as part of a future assortment. Articulation is fairly basic, one of the weaker toys in the line in my opinion. He has ball jointed shoulders, bicep swivel, single hinged elbows able to bend to about 90 degrees, wrists can move in and out for transformation, waist swivel, thigh swivel, deep knee bends due to the lower legs being hollow to allow for transformation and no ankle or foot articulation to speak of. Despite this basic showcase of joints, just having tight joints that perform their function properly makes this figure a huge improvement over this Skullcruncher. You can pull off a ton of basic poses but he won’t be performing any Metallikato moves any time soon. Krok’s accessory load out is the same as Skullcrunchers. A basic blaster weapon molded in neon plastic and his alt mode tail which can be used as a blaster, or maybe a shield, and can also seat a Titan Master. Krok is a strange one. He’s a fairly obscure character to begin with, and this figure really doesn’t pay tribute to the more recent renditions of him that have brought him to the attention of more fans lately. The mold is adequate with average articulation and an enjoyable transformation but has been released previously as a much more iconic character despite rampant QC issues. I personally really like his aesthetic, more than the original Skullcruncher version, however if you’re faced with a full shelf of wave 4 deluxe figures this is likely the weakest link among them. He is one per case so if you are at all interested in this guy and see him on the shelf I would say he’s worth a pickup, he’s just not worth picking up over someone like Topspin or even his fellow repaint, Quake.